There were a lot of runs to be seen in both of New York’s games last night, not the least of which came from Soriano. The Yankees followed their first series win in over a month with a 2-1 victory over the Angels on Monday. They would double LA up again on Tuesday, but the score was not nearly as close. The Angels held an early lead, hitting CC Sabathia for 2 runs in the first inning and, following a Vernon Wells solo shot in the bottom of the second, added another run on a bases-loaded walk in the top of the third to go up 3-1. Jayson Nix cut the deficit down to 1 with an RBI groundout in the fourth, and Alfonso Soriano reversed it with a 2-run homer in the fifth. New York’s bats truly awoke in the sixth inning, starting with an Eduardo Nunez RBI groundout to score Nix. Soriano followed with an RBI single and, after Robinson Cano worked a walk, Alex Rodriguez drove them both home on a double to put the Yanks up 8-3. The hits kept coming in the seventh when Nunez grounded into a force-out at second which allowed Curtis Granderson to score from third, and Soriano followed with a 3-run homer to give the Bronx Bombers a second-straight 4-run inning. Nunez added 2 more runs on a single in the eighth, providing the Yanks with a lead that was all but insurmountable. The Angels’ 4 runs in the top of the ninth were only good enough for them to lose by a marginally less lopsided tally of 14-7 as New York took the second of four games and Sabathia improved to 10-10 on the season. Soriano continued to build upon what would prove a historic hot streak early on Wednesday, starting the game off with a bang when he hit a grand slam in the bottom of the first. Another 4 runs would score in the second, beginning with a pair of RBI singles from Cano and Granderson. Soriano drove 2 more in with a double to put the Bombers up 8-0. Los Angeles did manage to hit Ivan Nova for a pair of runs in the third with RBI singles courtesy of Mike Trout and Josh Hamilton, and Trout drove in a third run in the top of the fifth, but that would be all the offense they could find that day. Soriano rubbed salt in the Angels’ wounds with a solo shot in the bottom of the fifth, and Chris Stewart rounded out the game with an RBI single in the seventh. New York won 11-3 and Nova got his sixth win of the season. Unfortunately, LA’s bats came to life on the same night the Yankees’ took a slight reprieve. Josh Hamilton started the scoring by hitting an RBI single off Phil Hughes in the first inning. Soriano tied the game by doing the same in the bottom of the third, but the Angels took the lead right back by hitting Hughes for a sac. fly and a homerun in the top of the fourth to go up 3-1. Hughes did not give up another run, but Chris Nelson (who was with the Yankees briefly this spring) hit Boone Logan for a grand slam in the top of the eighth, and the Angels notched another run before the inning was over to go up 8-1. The Yanks attempted to rally in the ninth with a Cano RBI single and a Wells 2-run double, but with two on and two out Nunez grounded out to end the game by a final of 8-4 as Hughes fell to 4-12 on the season and New York took the series 3-1. 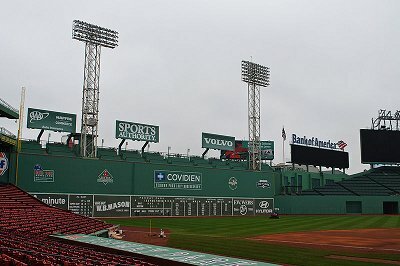 The team travelled to Fenway Park after winning their second series in a row, and they brought their bats with them last night. Soriano knocked in the first run against the Red Sox with a single in the first inning and newcomer to the Yankee organization, former Oriole Mark Reynolds, smacked a 2-run homer in the second inning for his first at-bat. Soriano one-upped him in the third by rocketing his 25th homer of the year over the Green Monster to drive in 3 more runs and put New York up 6-0. The blast tied a Major League record of 18 runs scored in a four game span, putting him in the hallowed company of Joe DiMaggio, Lou Gehrig, Jim Bottomley, Tony Lazzeri and Sammy Sosa. Cano hit an RBI single in the top of the fourth which was followed by the first Red Sox run in the bottom frame. Andy Pettitte looked sharper than he has in some time, allowing just the one run through six efficient innings, but the quality of his pitches took a dramatic dip in the seventh. After allowing two more runs to score he turned the ball over to Shawn Kelley to get the final out of the inning. A trio of RBI singles in the top of ninth from Ichiro Suzuki, Mark Reynolds, and Chris Stewart put the game well out of Boston’s reach as the Yanks took the first of three with a 10-3 victory and Pettitte improved to 8-9 on the year. The series will continue at 4:05 PM today and finish at 8:05 PM tomorrow as the Yankees try to gain ground on the second wild card spot. The Mets had two strong series against the Rockies and Diamondbacks, but they ran into a fair bit of trouble in Dodger Stadium. After losing Monday’s opener 4-2, Juan Lagares tried to provide New York some spark with a solo shot in the top of the first on Tuesday. The lead held for several innings, but the Mets were unable to add to it before Matt Harvey gave up a 2-run double in the fifth inning; a 2-run single in the following inning put the Dodgers ahead 4-1. Matt Harvey turned the ball over to the bullpen in the seventh, which in turn prevented LA from scoring again, but the only other New York run came on a John Buck single in the ninth. The Mets lost 4-2 and Matt Harvey fell to 9-4 on the year. Hoping to avoid a sweep, the Mets got their bats ready early in Wednesday’s close to the series. Andrew Brown drove in the first run with a double in the second inning, and Marlon Byrd launched a 3-run homer in the third to put New York ahead 4-0. That score stayed put until the bottom of the sixth when the Dodgers hit Dillon Gee for 2 runs to put themselves on the scoreboard. New York remained on top with Gee in position to collect a win until the last frame of regulation, but LaTroy Hawkins gave up a 2-run homer to Andre Ethier, tying the game 4-4. The score did not change through two-and-a-half innings of extras; however, Pedro Feliciano would see the game get away from him in just 5 pitches. After getting Carl Crawford to groundout in the bottom of the 12th, Feliciano gave up a double to a hustling Yasiel Puig on the first pitch of the at-bat. Adrian Gonzales repeated the performance, scoring Puig and giving LA a 5-4 walk-off victory as they swept the Mets. Thursday’s start to a four-game set with the Padres was just as tight for most of the night, though it would not go into extra innings. Josh Satin scored the first run for either team in the top of the fourth with an RBI single to bring Daniel Murphy home, but Zack Wheeler gave up his first and only run in the bottom half on a sacrifice fly to tie the score 1-1. Wheeler left the game after 6 innings having thrown 115 pitches; the score remained tied through the seventh which kept him out of position to pick up a win, however he did notch a career-high 12 strikeouts. Byrd finally brought an end to the tie with a 2-run double in the top of the eighth, and John Buck added a homer in the ninth to put New York ahead 4-1. They won by that same amount as Gonzales Germen earned his first save of the season through two innings of work. Last night, the Mets gave Jon Niese a lead to work with early on. An Eric Young RBI groundout in the second put them on the scoreboard first, and Marlon Byrd and Ike Davis smacked back-to-back homeruns in the third to go ahead 3-0. Niese did give up a homer in the bottom of the third, but after he worked a walk in the top of the fourth Daniel Murphy joined the hit parade with a 2-run blast to put New York up 5-1. Niese stayed on through six innings, striking out 9 along the way, and though the Mets would not score again San Diego only managed to put one more run on the board. Hawkins got his fourth save of the year as New York won 5-2. The Mets will try to take a series win when they play San Diego again at 8:40 PM tonight, and will play the fourth game at 4:10 PM tomorrow. Subject: LongIsland.com - Your Name sent you Article details of "Mets Beat Padres, Yankees Pummel Red Sox as Soriano Ties Record"